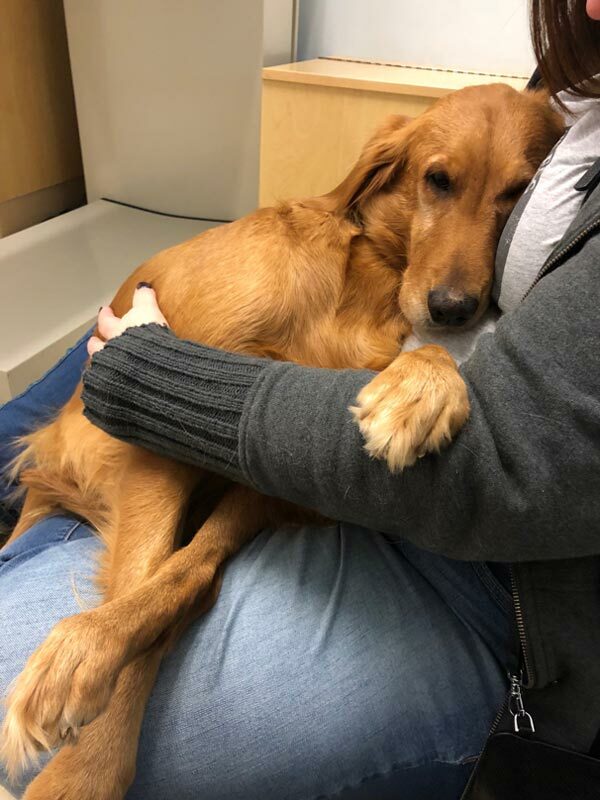 In the middle of Indiana cornfields and windmills, a golden retriever named Maggie was rescued from a breeding facility by a local shelter in desperate need of a new home—a new start. Her entire life, she was used as a caged breeder, producing puppies for profit until she could no longer produce anymore. At six years old, Maggie hadn’t seen much of the world outside her small barred home, until she was given a much-needed new beginning, when rescued and eventually adopted by her newfound owner. 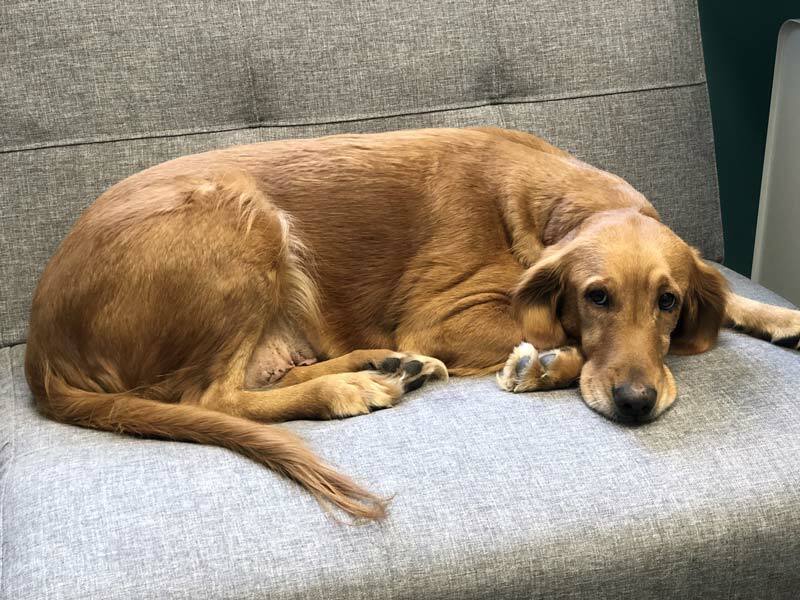 Scared, tired, shy, and shaken, Maggie wasn’t used to the inside of a home, cars, people, or other dogs to play with, much less a veterinary clinic. She came with no veterinary records or information about her history. Most dogs that come from breeding facilities don’t even come with their birthdate, but fortunately, with some good research, Maggie’s owner was able to find hers. Maggie’s owner called Pet Wellness Clinics and scheduled her first appointment for preliminary shots, blood work and a wellness exam. Knowing Maggie’s brief history, our staff understood the fear and anxiety she would be feeling and we wanted to do everything we could to make her first experience comforting. Her big sister, Hayley, was able to come along with Maggie, which we highly encouraged because we knew this would be a supportive companion for her. We know from personal experience how hard it can be on a pet owner to see your pup scared or in pain, which is why we make sure your first visit isn’t just reassuring for your loved one, but you too. Like every patient and newcomer, we welcomed Maggie with her name on our board! When she came in, we brought her straight back to the room with her owner and Hayley. Prompting Maggie’s sister to get on the table, Hayley jumped up and greeted our veterinary technician with a big grin on her face. Once Maggie saw how comfortable Hayley was, she felt more confident throughout the entire appointment. Our veterinary technician did a new patient assessment and provided recommendations on the shots, blood work, and preventatives Maggie needed. We recommended the Pet Prime Membership because it would provide Maggie’s owner significant cost-savings and cover a lot of the care costs she needed. When it was time to get Maggie’s bloodwork, we didn’t want to separate her from her family, fearful, she would think she’s being sent away again. So, we invited her sister back in the lab with us so Maggie would feel more comfortable that she was in trustworthy hands. The whole time the dogs were in the lab, their owner waited outside the door, peaking in over the window so the dogs could see their loved one wasn’t too far away. During Dr. Graves’ visit with Maggie, he gave a thorough exam, speaking softly and calmly, careful not to pressure or scare her. He recommended waiting to give Maggie her boosters and nail trimming until her spay appointment so it was less overwhelming on her first day. While we knew Maggie had a long way to go, we told her owner that she was doing great, there were no major concerns and we couldn’t wait to see how much she grows in the next three months. Inviting a pet back for their second visit is always exciting for us. 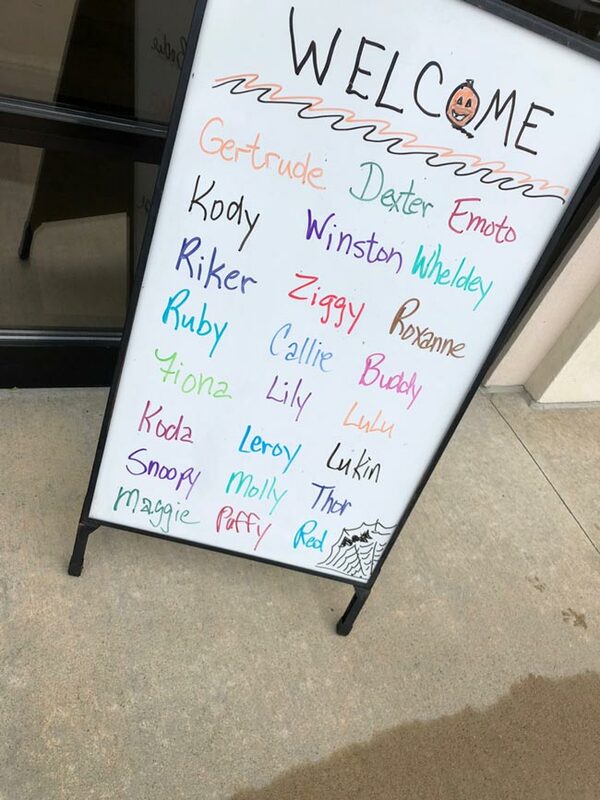 We love seeing how much they’ve grown and how much more comfortable they are with our facility and staff. Maggie and her owner were coming in for Maggie’s spay appointment. When they arrived, we could already see the positive improvement in Maggie’s health and stride just after a few short weeks. Knowing Maggie’s fragile history, we wanted to give her and her owner a moment to themselves before taking her back. As a veteran bred dog, Maggie produced tons, if not hundreds, of puppies. This surgery would provide her a fresh start, significant health benefits and peace of mind for her and her owner. At Pet Wellness Clinics, we offer a laser treatment that speeds up the healing and recovery time for spay and neuter surgeries. Maggie’s mom was thrilled when we shared how affordable it was and that Maggie would be back on her feet in no time. To prevent pets from licking at their stitches, we give pup parents the option of a “party hat” or a onesie for their pet’s recovery. 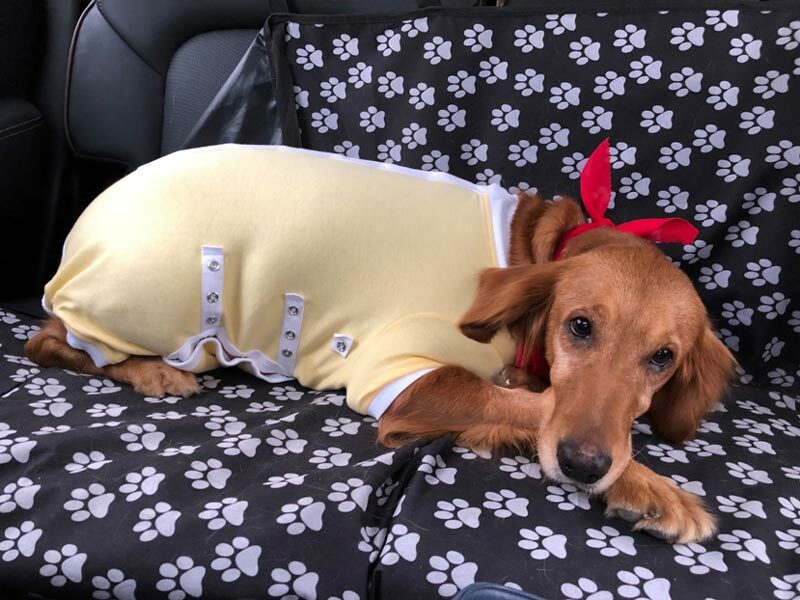 Maggie’s owner gladly chose the onesie option because she feared the “party hat” would cause too much anxiety for Maggie’s sensitive well-being. 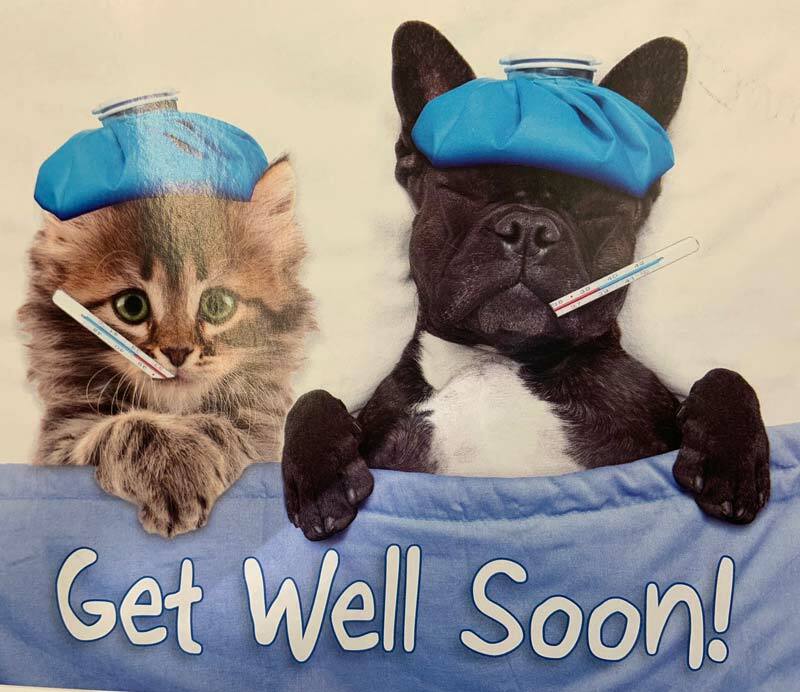 With any animal surgery, the recovery can be tough and tiring for pets. We know for pet owners, it’s just as hard! 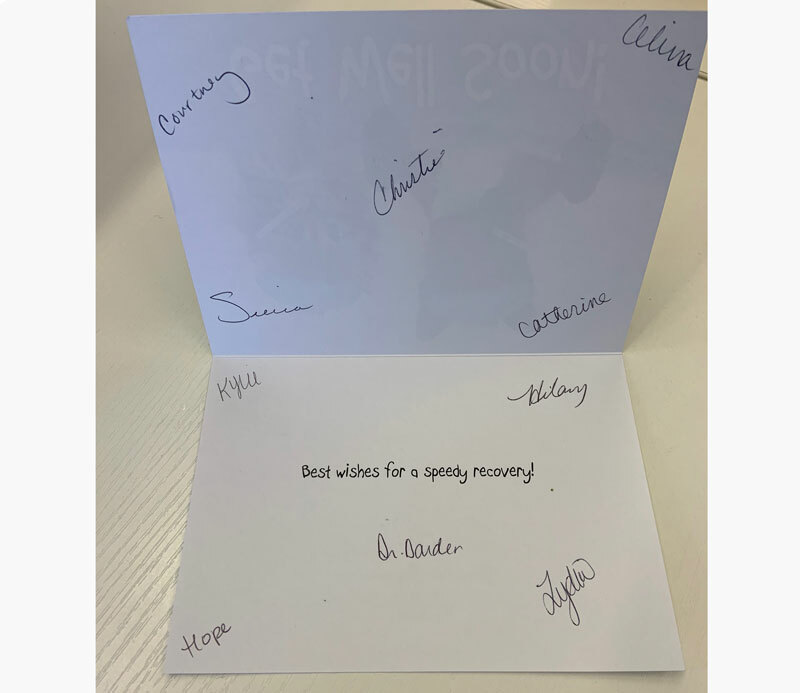 After every visit, we make sure to send our speedy and comforting wishes in a “get well” card. We were pleased to hear Maggie was doing great! Maggie’s story is unique because of her history, but her experience is one we cherish at our clinic. It’s what sets us apart and what makes our jobs so rewarding. We hope you keep following along with us as we track Maggie’s progress and experience at Pet Wellness Clinics!